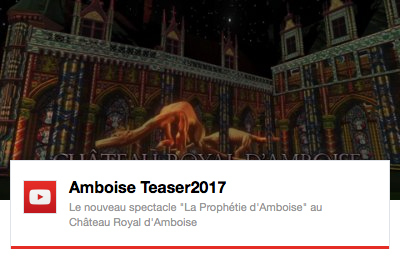 "The Amboise Prophecy" spectacular is a new event that falls within a broad regional development project. It rallies together, all year round, hundreds of volunteers at the important national heritage site of the Royal Château of Amboise. Volunteers have set up various workshops, some of which create high quality period costumes or specialize in the production of 15th century props. For this new show, the French organization of craftsmen and artisans "les Compagnons du Tour de France" contributed greatly to the production of the new accessories, such as cannons and catapults. The night-time sound and light spectacular 'The Amboise Prophecy" is also an opportunity for visitors coming to the area, whether in small family groups or as part of organized tours, to discover the rich heritage of the Loire Valley and Touraine Province. Prolong your stay by eating out in one of our local parntership restaurants, or stay overnight in one of our partnership hotels, bed and breakfasts, holiday rentals or campsites. "The Amboise Prophecy" spectacular, with its numerous social and economic network parnterships, is able to offer an innovational model that combines, culture, tourism, and the local economy. One of the first of its kind in Touraine ,the show attracted over 19,000 spectators in its first year.